Paua dangle used here, is a 10 mm coin shaped bead, dressed up with a hammered frame of argentium wire. All silver work handmade using argentium wire. 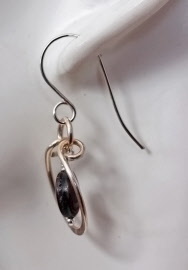 Earrings measure 1⅝ inch from top of earwire to bottom of dangle.